The diagnosis and management of proteinuric renal diseases and the staging of chronic kidney disease (CKD) require accurate identification and quantitation of proteinuria. The usage of urine protein/creatinine ratio to estimate daily urine protein excretion is prevalent, but relatively little attention has been paid to the influence of urine concentration and its impact on test accuracy. Scientists at the Taipei Veterans General Hospital (Taiwan) and their colleagues collected 540 urine samples with complete data of 24 hour urine protein concentration, creatinine concentration, total volume, and most importantly, a concomitant urinalysis of the same urine sample. After the total volume of the 24 hour urine sample had been measured and the storage container had been gently shaken for 10 seconds to mix the urine, two 10 mL specimens were sent for urinalysis and urine protein creatinine concentration measurement, respectively. The urine protein and creatinine concentration of 24 hour and spot urine were both determined by the Hitachi 7180 Autoanalyzer (Hitachi; Tokyo, Japan). 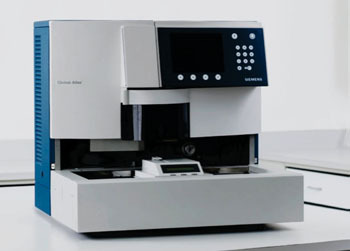 The specific gravity of the urinalysis was analyzed by using the Clinitek Atlas Automated Urine Chemistry Analyzer (Siemens Healthcare Diagnostics; Erlangen, Germany). In order to a compare distribution patterns of urine creatinine concentration between 24 hour and spot urine samples, a concurrent database of single voided urine samples collected during June 2010 to May 2014 were examined. Spot urine samples were collected at any time point of the day. There were 31,551 urine protein/creatinine ratio (UPCR) spot samples with a concomitant urinalysis examination. The investigators found that found that for dilute urine samples with specific gravity equal to or less than 1.005, a sample with urine creatinine equal to or less than 38.8 mg/dL was more likely to overestimate actual daily urine protein excretion by using UPCR. For urine samples with specific gravity equal to or greater than 1.015, equal to or greater than 1.020, and equal to or greater than 1.025, those with urine creatinine concentration equal to or greater than 63.6 mg/dL, equal to or greater than 62.1 mg/dL, equal to or greater than 61.5 mg/dL, respectively, were more likely to lead to an underestimation. The authors concluded that the UPCR in samples with low or high specific gravity is more likely to overestimate or underestimate actual daily urine protein amount, respectively, especially in a dilute urine sample with its creatinine below 38.8 mg/dL or a concentrated sample with its creatinine above 61.5 mg/dL. In particular, UPCR results should be interpreted with caution in cases that involve dilute urine samples because its overestimation may lead to an erroneous diagnosis of proteinuric renal disease or an incorrect staging of chronic kidney disease. The study was published on September 9, 2015, in the journal PLOS ONE.